This would have been cute had she not done this at least twenty times already. “Stop it, Natalie. That’s annoying,” Tommy grumbled. I mean, it’s great she’s learning to spell in Kindergarten. But does she have to constantly spell no at me? And she not only spells it at me. She writes it all over the house. On paper, thank goodness, but she’ll silently hold up the paper and tap on it. She does know how to spell yes. 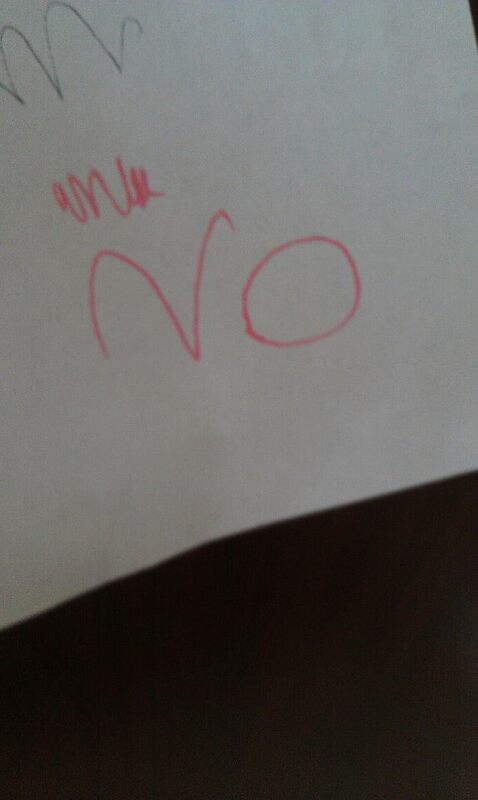 She just prefers to spell no. Apparently. “If you don’t eat your broccoli, you won’t get a popcicle,” I explained. Natalie clamped her mouth shut. But the no thing makes me twitch. I’ll tell her it’s time to take a bath. “I’ll add bubbles,” I promise. I know I shouldn’t bribe like that but when Tom isn’t around, my patience is thin. She knows this. I was an only child, raised without the constant noise and chatter, and one would think I’d be used to it at this point but no. Still, sometimes it can be sweet. Sometimes. Like when I went, “Do you love your momma?” and Natalie went, “Y-E-S” while stroking my cheek. 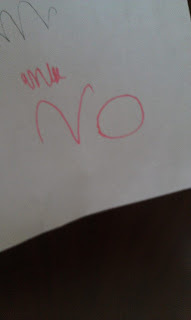 However, it’s not sweet when Natalie holds up her paper and points at the word no dramatically. Soon she’ll be spelling more words which means Tom and I can no longer spell things when we don’t want her to know what we’re talking about. I think that we only have a few more months of spelling before Annabelle gets what we're doing. Right now if we spell really fast or just do part of the word we can get by. It is a change when they learn how to spell and you can't talk in secret spelling code anymore! She's a funny one, that kid. "No" is a powerful concept to a tiny person; they spend their whole first decade in intense on-the-job-training for existence. They're forever having to get explanation, receive instruction, and basically get told what to do - and to not do - all the time. When they grasp the concept of rejecting this stream of directions, I guess they can get a little drunk with power...I know I did! But your baby is a real sweetie...that y-e-s cheek stroke was so tender! And although it made you twitch, that sign-tapping thing sounds pretty funny in hindsight; like a passive-aggressive librarian pointedly tapping a No-Talking sign at an inconsiderate patron. Was having a glass of wine with the neighbor last night and her one-year-old had learned no. As I said, "Baby Girl has two older brothers. No will serve her well!" Too cute! I love that! 'Eat your broccoli, dear, and cut the showing me how much you're learning.' Motherhood is brilliant. Stopping by from SITS! Hope you are enjoying your weekend! LOL That's so cute. Sounds like something my daughter would do.